The mother Chamari Samaratunge is a Medical Doctor from Sri Lanka, presently residing in Malaysia. She has been a Sai devotee for the past 26 years and came to Swami through a mysterious dream that she had at the age of twelve. In the dream, Swami was standing on a lotus with His raised abhayahastha (blessing posture). She had no clue of who He was. Chamari shared this dream with one of her schoolmates explaining that she dreamt of an African man in an orange gown blessing her. The friend, through her grandmother, then led Chamari to the “man” in her dream – Sri Sathya Sai Baba. Since then Chamari has been an ardent devotee of Bhagawan despite none of her family members sharing her faith. Parvinth, Chamari’s only son, is bound to Swami to such an extent that he uttered the word “Baba” even before he learnt to say “Amma” (Mother). Parvinth has been immensely blessed with divine dreams of Swami since he was one and a half years old. Following such dreams, little Parvinth would search for Swami all over the bed. He would then go straight to the altar without taking notice of his mother and stand in front of Swami’s picture for about ten minutes, chanting the mantra ‘Aum’. Only after that he would come to his senses and pose a serious question to his mother “Where is Baba?”. 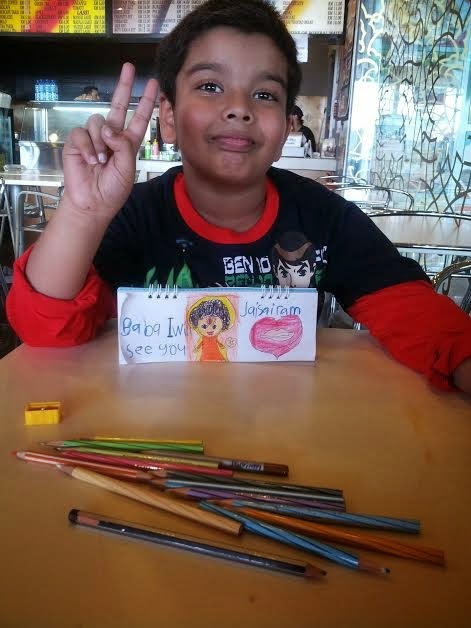 When Parvinth was five years old he had a dream where he saw Baba coming down from the sky like a rocket and landing on a big red colored cloth. There were many people gathered to see Him coming down. They were cheering out His name ‘Sathya Sai’. As Baba landed, people started chanting ‘Sathya Sai’ in an even louder voice and gathered around him. Baba was surrounded by people and He blessed them all. One may be tempted to draw similarities between Parvinth’s dream and one of Swami's own predictions that in the future He would fly across the sky from place to place. Parvinth’s mother was taken by surprise by the way he described his dreams and how passionately he talked about Swami. She firmly believes that he was a staunch devotee of Swami in his previous life, which is why he is getting these dreams in this life. As if to underline that belief, Parvinth had a peculiar dream, or rather a Divine experience, on the 25th of May 2013. In the dream Pravinth saw Swami opening the door and coming inside his room. He asked Parvinth to sit on His Shoulders. Parvinth jumped and sat on Swami’s shoulders with his legs dropping on either sides of His neck. Then Swami disappeared into the clouds with him. Swami and Parvinth walked on the clouds. At one point Swami asked him to dig in one of the clouds. Parvinth started digging until there was a hole in the cloud through which Swami showed him the Earth. There was a green field down there (maybe a valley) with a small brown house. Parvinth asked Swami what that was. Swami replied “That is My house”. Parvinth then saw a an old lady with a basket full of orange balls and wondered who she was. Swami replied, “That’s Eshwaramma”. She was distributing the orange balls one by one to the poor people seated on the ground. They were all elderly people, 18 men and 18 women and all were 79 years of age. Parvinth asked Swami about the orange balls and He replied “it’s laddu”. Then Swami brought him back to his room, sent him to his bed and returned. When Parvinth woke up, he wanted to go back to the clouds. Chamari was astonished and gathered the details of the dream by asking her son many questions on it. A Sai friend of Chamari interpreted the dream by relating it to an event on the occasion of Swami’s 80th Birthday. The Lord had celebrated the 80th birthday of a few chosen couples on that occasion. 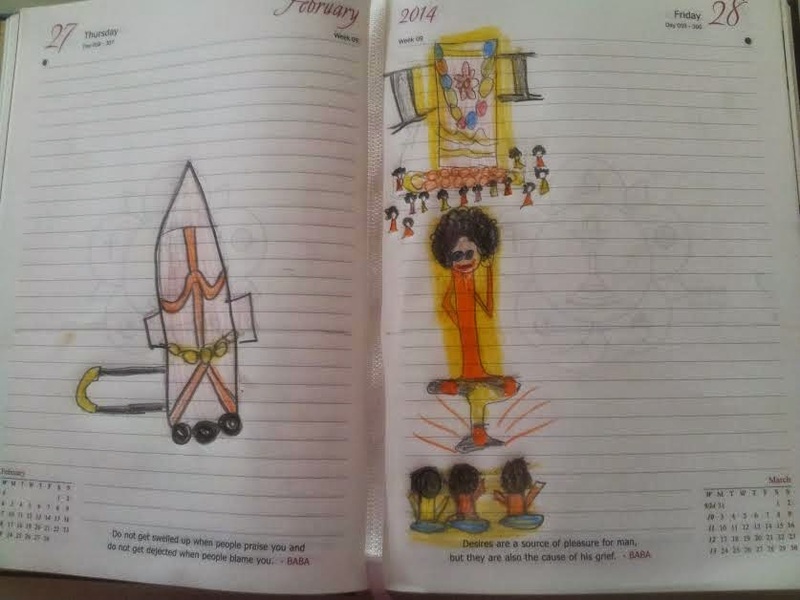 Chamari was wonderstruck as she learnt about this since her son had described the men and women in his dream as being 79 years old and Swami’s 80th birthday was celebrated two years before Parvinth was born. Hence Chamari has a feeling that her son (in his previous life) could have been a part of that selected group of elderly couples. Could it be that Swami took Parvinth there to remind him of an episode from his previous life? 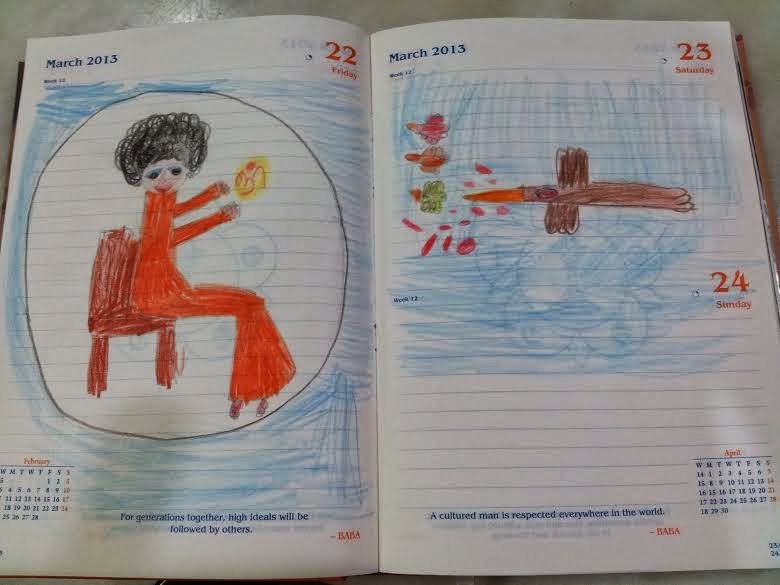 Parvinth had another interesting dream on 23rd March 2013 where he saw Swami seated on a brown chair inside a big bubble. The bubble came from the Space to this Earth. Swami looked around and exclaimed “How beautiful the Space is!”. Suddenly a big eagle appeared near the bubble. The eagle caught three small birds and swallowed them up. Flames came out of the eagle’s mouth which entered Swami’s bubble and touched His orange robe. Upon this the robe turned yellow. Swami felt the pain when the flames touched Him and His face turned sour. Then Swami raised His hands in the blessing posture and there was an Aum symbol on His palm. At that moment the eagle suddenly vomited the three birds and they came out with blood on their wings. As they flew away, the blood splashed and dropped on the eagle but did not touch Swami. Then slowly the bubble holding Swami started coming down to the Earth. Swami was now smiling. The dream was interpreted by Chamari in the following manner. It was around the same period when Swami started falling ill two years before. The eagle swallowing the small birds could signify the bad karma of humanity; the flames could denote the fruits of bad karma. The flames touched Swami indicating that He took over the karma on Him. Swami’s robe changing the color and face turning sour could correspond to the deterioration of His body. Swami’s blessing hands made the eagle spit out the birds which could mean that the humanity came out of the bad effects of the karma with His blessings. The bubble coming back to this Earth may be an indication of Swami’s return. The bubble itself could symbolize that Swami Himself is unaffected by any of these happenings! Parvinth was not content with seeing Swami in dreams alone and had a strong urge to see the “real” Swami in Puttaparthi. Chamari decided to take Parvinth there, however she was in a big dilemma. In the fear of breaking the little boy’s heart, she had never mentioned to Parvinth that Swami has already left His body. But she had the strong faith that Swami would take care of her son. In November 2013 Chamari visited Puttaparthi along with Parvinth to take part in Swami’s birthday. That being Parvinth’s first visit to Parthi, he was very excited at the prospect of seeing Swami in real. Chamari did not have the heart to break his enthusiasm. She prayed hard to Swami to give Parvinth His darshan in Parthi for atleast a few seconds so that Parvinth would not be disappointed. In Parthi, Parvinth waited eagerly for three days to have Swami’s Darshan, persistently enquiring his mother as to why Swami wasn’t coming. The very next day, as they were in the Kulwant hall, Parvinth started shouting “Amma, Baba has come, see He is sitting on the swing”. Chamari thought that he was referring to Swami’s picture that was kept on the swing. However, Parvinth insisted that the picture was behind the real Swami. When Chamari asked him the color of the robe that Swami was wearing, Parvinth answered as orange. Now Chamari was convinced that Swami really gave him the Darshan as Swami was wearing a white robe in the picture on the swing. The Divine vision lasted for 6-7 minutes after which Parvinth told Chamari that Swami has gone inside. Now he wanted to know when Swami would come out again from His room! Chamari was ecstatic and silently thanked Swami for His Grace. Both the mother and the son returned home satisfied. The Divine play between the Lord and His child continues. Parvinth had a very special dream on the early morning of Shivarathri (28th February 2014) that clearly indicates the return of the Lord in the Sathya Sai form. Parvinth saw his mother and himself by the roadside in Puttaparthi. A beautiful chariot carrying Swami’s brown colored statue was being brought through the road and a lot of people were following the chariot. Parvinth and his mother too followed the chariot until it reached the Sai Kulwant hall. As soon as the chariot entered the hall, a small light came out from Swami’s “sleeping box” (Chamari had shown him the MahaSamadhi in Parthi explaining that it was Swami’s sleeping place) and entered the brown statue. All of a sudden, the statue burst open and Swami came out. There was a thunderous applause from the gathering. Swami blessed all with a smile as He walked up to and stood on the stage. Then, in an instant He multiplied Himself into 81 Babas. 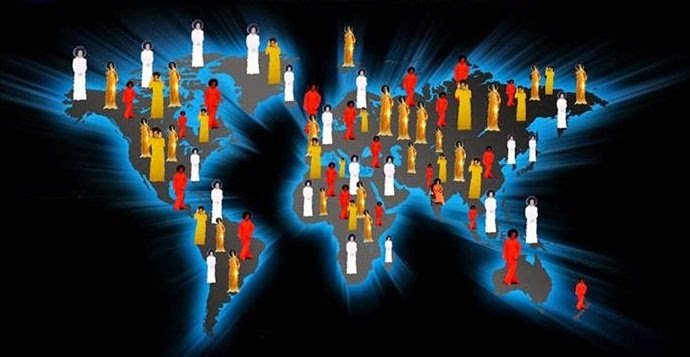 Their robes were changing colors from time to time into red, yellow, white etc. Swami who was on the stage stayed in Parthi and the other 80 Babas left to 80 different countries! As Swami mentions in the above words, He is engaged in a gigantic task that is beyond our imagination and understanding. However, in the form of many Divine pointers being bestowed through His special ones like Parvinth, Swami has been allowing us to catch glimpses of the glorious times that are awaiting us. Let us pray to our dear Lord that we may be chosen to witness the magnificence of His reappearance in the full glory to usher in that beautiful blissful heaven on earth - the majestic Kingdom of Sai. HEAVEN AND EARTH MAY FALL APART BUT SWAMI'S WORDS WILL NEVER FAIL. HE WILL RE-APPEAR AND CONTINUE HIS GIGANTIC TASK TO TRANSFORM WORLD AND BRING PEACE AS HE PORMISED. If only few people believe in His reappearance, it is also His will. Many will be awoken from the freightening dream of natural calamities and then only they will start believe in the Lord!